Tiny Flower, the box turtle hatchling found cold-stunned and dropped on my doorstep on 14 November, has become quite active this last week. In her makeshift terrarium with a beautiful southern exposure to the Fresh Brook marsh from my garage lab, she had settled into a slow but sure rhythm through December and January. She would hunker down beneath her pile of oak leaves for a couple of days, then lumber over to her wading pool (a converted sushi bowl) where she’d lounge for a few hours, stopping and grazing at her food pile en route to the pool and back to her hiding place. For the last week or so, she’s begun daily power walks, active on and off from dawn to dusk. She spends a lot more time in her two pools and almost no time hiding under the leaves. If she’s reacting to the new sun angle in anticipation of spring, she seems a bit premature. But on the other hand, when you live in a temperature-controlled, humidity-controlled habitat with a nice heat lamp to keep life warm and toasty, spring may simply be a state of mind. 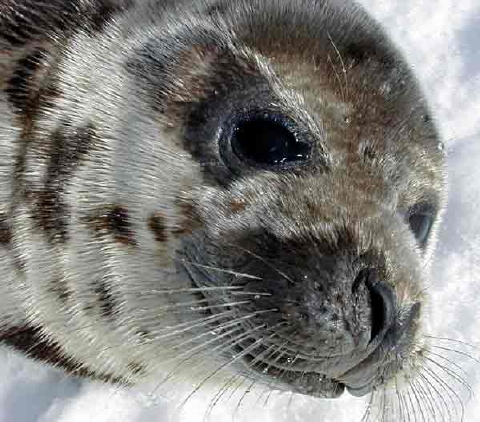 The juvenile harp seal found ailing in the Fresh Brook marsh on Tuesday morning, and returned to the marsh after emergency treatment Tuesday evening, died overnight. When I checked her Wednesday morning, her body had just entered rigor. The necropsy performed by the Mammal Stranding Network revealed an impaction of the tail end of the stomach with sand and worms. The middle of the intestines was impacted with 2.5 feet of sand, and the end of the intestines was obstructed with black, dry, sandy feces … about a foot long. For some reason, the animal kept eating sand rather than snow. Another harp seal pup, this one quite healthy and active, turned up in Fresh Brook this morning. 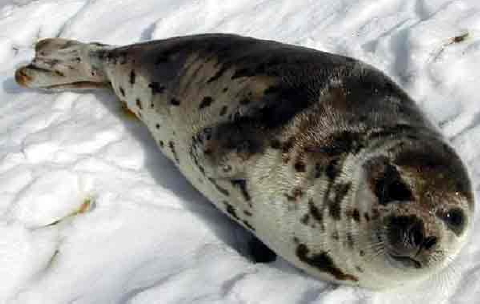 Quite an exceptional year for harp seals in the Land of Ooze. Contrasting with the ailing seal discovered in the Fresh Brook marsh this morning, a very healthy harp seal pup was found playfully flopping about Pleasant Point off Blackfish Creek. A little less than three feet long, maybe a half foot shorter than the other juvenile, this seal was markedly plumper and fully aware of its surroundings. Basking on the crunchy snow left over from the weekend blizzard, this fellow was bright eyed and beautiful. Harp seals are usually rare in Wellfleet Harbor, but this season has brought us quite a gaggle of youngsters to share the winter weather. 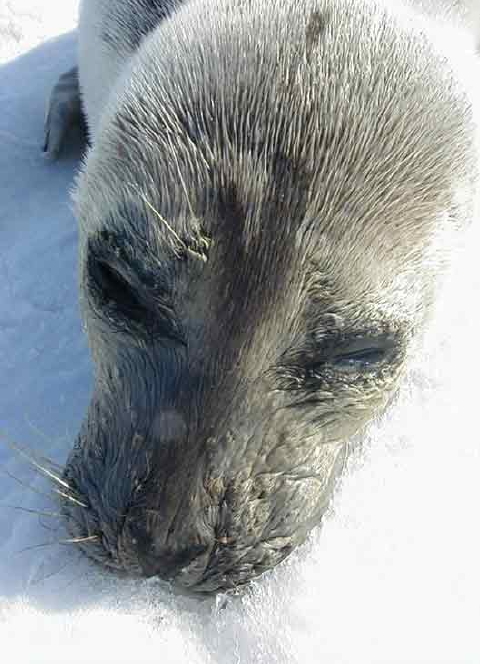 Last night’s high tide brought an ailing harp juvenile seal into the Fresh Brook marsh northeast of Doctors Hill. Seemingly well nourished, this pup was nonetheless unresponsive to my approach. 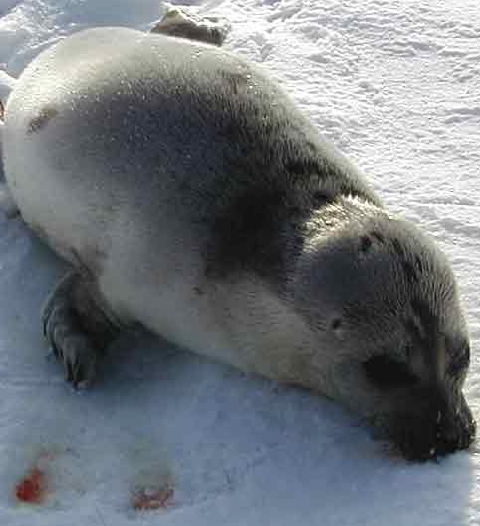 Blood traces were observed in each location where the seal had moved across the snow covered marsh. Closer examination revealed no wounds; the blood had exuded from the mouth. Small amounts of whitish fluid gurgled from the nostrils. Doctor John Kelly of Eastham was gracious enough to evaluate this seal at his animal hospital; he decided that it was not so far gone as to be euthanized. At the request of the Mammal Stranding Network, he administered 200 milliliters of nutrient solution by stomach tube. Encountering some initial resistance, Dr. Kelly x-rayed the seal, but found no blockage. 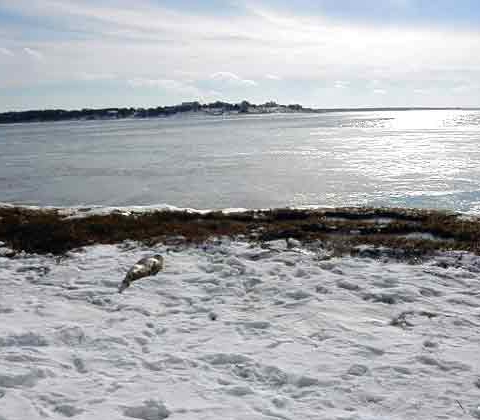 After treatment, this harp seal was returned to the salt marsh near where it was spotted this morning. 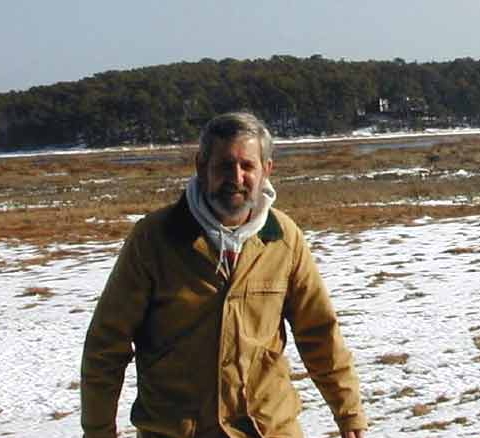 The original location is frequented by coyotes, foraging at low tides, and the channels in Fresh Brook do not provide easy access back to the bay. 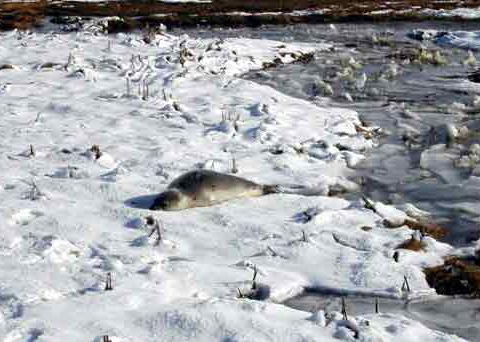 The seal now rests on the banks of Black Duck Creek several hundred yards southwest of the Lieutenant Island Bridge. We’ll check on her overnight progress in the morning. 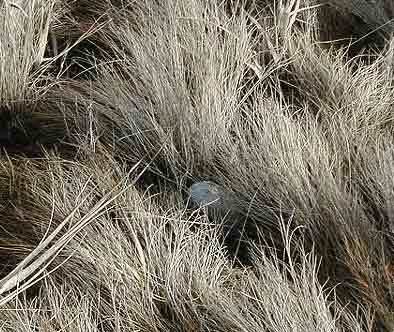 A balmy 40+ degrees and a gentle breeze transformed the ice encrusted Fox Island marsh into a salty hayfield. 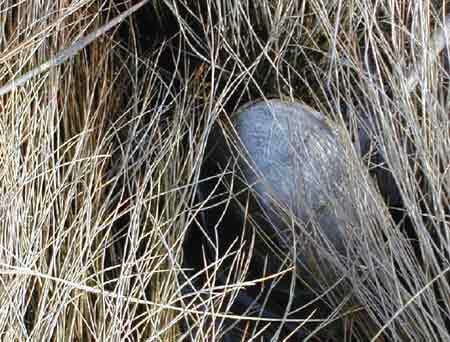 Exposed by the thaw, yet nearly invisible beneath thick, matted marsh grass, was the remains of an adult male terrapin. 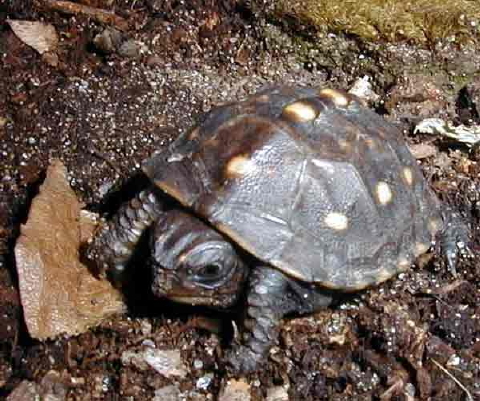 Plastron and carapace smooth by age, this mature male measured 12.1 centimeters straight-line carapace length and 10.5 centimeters plastron length. The shell itself was water-logged from long exposure. It exhibited no scratches nor predation marks. Since 3 November, the Fox Island Wildlife Management Area has revealed a total of 25 diamondback terrapin remains: 12 identified as male, 11 as female. They ranged in age from several three-year-old juveniles to many smooth shelled elders. Five had previously been observed and marked, including one male which was seen active and healthy as late as 30 September of this year. Last year this same area yielded nearly a hundred dead turtles. 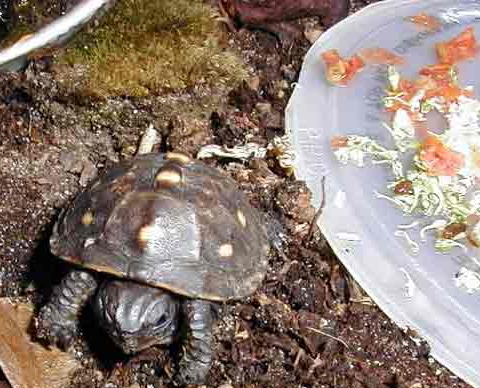 You are currently browsing the Turtle Journal blog archives for January, 2001.